GET ON THE GROUND FLOOR OF ONE OF YAKIMA'S BEST KEPT SECRETS!! A FAMILY OWNED PARK LOOKING FOR YOUR FAMILY!! Most lots are 50' x 100'. Plenty of room for most double wide homes. 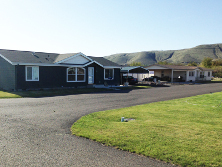 We also have a couple of slightly larger lots that may accommodate your triple wide. While we are close to many shopping areas, Meadowloands has a rural feel about it. 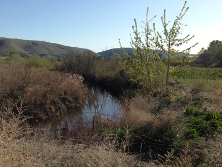 Being surrounded by two creeks (Bachelor and Ahtanum) allows for many trees and plant life. These also attract a variety of wildlife, from a resident covey of California quail to redwing blackbirds, willow goldfinches, mourning doves and many other birds. Across the fence (on the neighbor's property) beavers build dams that attract water fowl. We occasionally get a coyote that strolls through the park. Last but not least we have Herman, the great blue heron. Herman frequents the park and eats mice and gophers. He is a real addition to the park. On South 5th Avenue just south of Ahtanum Road. A rural atmosphere that is close to many commercial amenities. the park is 3/4 of a mile from the Main Post Office and a variety of restaurants and shopping venues. 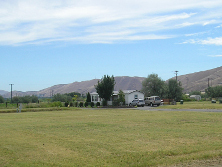 The Ahtanum Youth Park is right next door. The park is on the City of Union Gap's bus line. My wife and I were looking to buy several acres to get the rural atmosphere, birds, animals, trees. The first thing that stopped us was the price. The second was the necessity of putting in a well and all the other things necessary to water any acreage. Third was the upkeep on that much property. We looked at Meadowlands and found what we were looking for and not to have to do the upkeep and maintenance. We've really enjoyed our time at Meadowlands.